Pachter: On-Disc DLC Is "Just Plain Greed"
Unlocking on-disc DLC without paying for it may not be illegal. At least, according to market analyst, Michael Pachter. Developers and publishers argue that locked "downloadable" content on game discs is a response to rising development costs, and that it's a clever way to use developers who would otherwise be sitting around twiddling their thumbs. 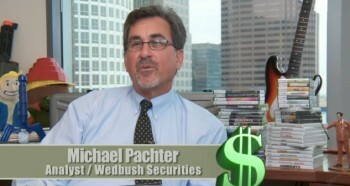 Pachter disagrees. "Yeah, it's just plain greed," he said on Pach-Attack. "The answer is that simple. I think that DLC has been so successful that publishers are trying to get a jumpstart and if you put it on the disc it allows them to unlock it when they feel like it." "Some guys get it right," he continued. "Some guys take a long time to get it out, putting it on the disc allows the publisher to determine the optimal moment to launch it. All DLC is great, games are getting shorter, DLC is keeping people engaged, it's a profit deal. I don't think it makes much difference how it's delivered." So it makes sense - at least from a business perspective - for developers to create DLC, particularly day-one DLC, which usually sells far better than content released later in a game's life span. But if the content is on the disc,, and you own the disc, is it legal to access said content without paying? Pachter suggests that may be the case. "The stuff on the disc, some gamers feel entitled to because they bought the disc, so they should have a right to anything that's on the disc," he said. "And that's a dicey one, you actually do own the disc and I think, theoretically, if you could crack the code on the DLC you probably would be allowed to access it without paying. And I'm not even sure that's stealing because you did, in fact, buy the disc. That's about as close as you can get to legal piracy." Pachter predicts that the practice is on its way out, as gamers will eventually "push back" against practices they consider anti-consumer. If I may grumpily editorialize for a moment: I don't see that as particularly likely. Based on my experience with the industry, the gaming public will accept any hilariously anti-consumer practice provided it's spearheaded by a popular title. Many are point out that Capcom's recent decision to nix on-disc DLC is a step forward, but the company has only said it's reviewing how such content is "delivered." Is there a notable ethical difference between on-disc DLC and day-one DLC? Because I'm not really seeing it.